A couple of weeks ago I told you about my favourite games from the IGF student contest. My first choice and the winner of the competition was Tag:The power of Paint. A truly innovative game where you use different colours in first person perspective to create different environmental effects to puzzle your way through levels. Top notch stuff. The team behind this gem was kind enough to allow us a very interesting interview. Let me start by saying congratulations for an excellent, innovative game and winning the IGF contest. When we first saw it we were very impressed by the ideas it is bringing in the industry. Here in allround geek we have always been fans of the independent game productions. We find that independent developers are more free to create unique games and try new stuff. How did you come up with the idea for TAG? We started development on Tag in May 2007, but the game was very different back then. After about a year of experimentation with mechanics that made use of the paint technology left over from our initial design, we were dissatisfied with the state of the game. At the time, it was a fairly generic FPS with dead simple AI enemies and power-ups. To progress, the player had to kill the enemies to charge a power-up that he could use to move to the next area. We wanted to add more depth to the gameplay and encourage players to paint more, since the paint was, by all accounts, the coolest gameplay element. 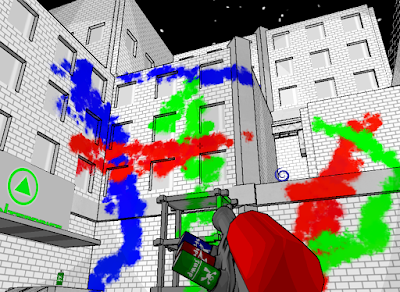 To make the game more interesting, we were considering directly associating the active power-up with whatever color the player had selected, as well as allowing the paint to affect objects in the environment. For example, red paint might speed up a moving platform. 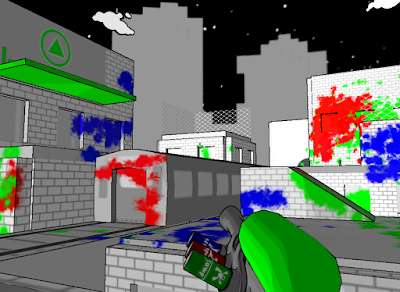 Then in late May 2008 during a game design meeting with our Professor Ben Ellinger and several of our classmates, two of the developers from the team behind Haxsys 2.0 (another game from DigiPen) chimed in, and, after a brief exchange, suggested that the paint on the environment should instead give the player his power-ups. It was simple and elegant, and it met our design goals. We began developing the new mechanic right away. What were the difficulties of bringing the game from idea to completion? The greatest challenge during development was taking the game from an interesting idea to a fun, polished experience. We overcame the challenge through frequent play testing, iteration, and a lot of hard work. Throughout the entire development cycle, we were never afraid to scrap everything that was less than stellar and start fresh with what was great. Do you consider yourselves to be more artists or more of the technical sort? How did that affect the development of TAG? As students in DigiPen's Real-Time Interactive Simulation (RTIS) program, we are definitely more technical. Unfortunately, we did not have the opportunity to work with artists until very late in project, beginning when Josh approached us after an inspiring presentation of the game. As a result, our content pipeline was fairly rough, and our visual style suffered – something we intend to rectify in our next project. However, working with artists was a good experience overall, and it did wonders for the look of the game. You use a colorless urban environment in TAG. Is this just a gameplay choice or is it a feeling/statement as well? Initially, we used a grayscale world because we didn't have artists to create texture art. It was a practical way to make the paint stand out, which made it easier to focus on the rest of the experience. Once we had artists, the look had been around so long it just stuck. Did you use an existing graphics engine or did you create your own for TAG? Why did you make that choice? As part of our curriculum at DigiPen, we built our entire engine from scratch. We chose to use DirectX as our graphics API and FMOD for sound but apart from that, everything else was in-house. DigiPen requires that all the student teams create their own game engines. Are you planing on expanding the game? More levels ? More colors ? What does the future hold for TAG? The current version of Tag is a complete student project, and we officially stopped development at the end of October. There are no plans to expand upon it at this time, since it would be outside the scope of the project. We're treating it as a proof of concept and looking toward the future. Are you planning on releasing a Linux or Mac version? During the last years there has been an increase in casual and puzzle games. Especially after the arrival of Portal, puzzle games have broken into the mainstream market. Do you think there is more room for innovation now? There's always room for innovation. Which games have influenced you the most ? What games do you play the most? Is there a difference between these two? The only game that influenced development directly was Portal. People began comparing Tag to Portal shortly after we implemented our core mechanics. Recognizing that it was not only Portal's unique concept but also its flawless presentation that made it such a huge success, we used it as an inspiration for the pacing of our levels. Each of us has different tastes in games, so there is little overlap. During development, we periodically had Rock Band nights to take the edge off. What do you think about the state of the industry as gamers and as independent developers? Is it moving forward or do the companies play it safe producing the same titles over and over again. There is entirely too much redundancy in the industry today, since most publishers tend to play it safe and rarely experiment. However, with the rise of digital distribution and recently growing support for independent developers, change may just be on the horizon. What does the future hold for the TAG team? Are you planning any new games? At the moment, our focus is on finishing our degrees and beginning our careers, though we are extremely interested in the prospect of following in Narbacular Drop's footsteps. If all goes well, developing a "spiritual successor" to Tag may be in our near future. Thank you very much for your time and all information you shared with us. I wish you guys the best of luck with anything you do. I can't wait to see what you will bring us next. And that's what happened: Portal 2 in a year!